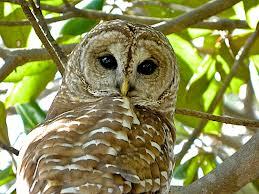 One Friday in August, I looked out our kitchen window and saw something I had always wanted to see: a Barred Owl. All my life, I had admired owls in zoos and animal parks but I had never seen one in nature. This bird was resting on a branch of our giant oak tree only 15 feet away from me. I stared in awe as he lifted his claw and scratched the side of his face, then swiveled his head from side to side and ruffled his feathers. I ran upstairs to get my partner Ron and together we watched the owl like he was an award-winning documentary. Already, we were under the animal’s charismatic magic spell. Every 15 minutes I took a break to commune with the bird. Once a butterfly fluttered around the owl’s head and the owl followed its movements like a child would watch soap bubbles. Every movement was interesting to me. The owl slept; with its great eyes hooded its face seemed empty. Upon awakening, it stretched its wondrous wings (a wing-span of almost four feet, our bird book reported) and preened. 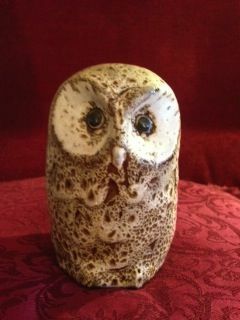 I gazed at the owl and the owl stared at me as if looking deep inside my soul. During the course of the day, several friends and neighbors came over to view the winged visitor. They were as excited, mystified and awestruck as we were. As I marveled at the beautiful brown and white patterning on the owl’s chest, I remembered my first glimpse of such a creature: at a pottery store in Pigeon Forge, Tennessee. I was 14 when my family vacationed at a friend’s cabin in the Smoky Mountains. One day we went into town, ate at a fried chicken restaurant and toured the pottery factory. My brother and I were each allowed to select one item from the seconds’ table and I chose a small Barred Owl. I loved the whimsical, serene and profound look on the figurine’s face. Though I had saved very few things from my childhood that souvenir was still with me. Miraculously, I knew right where it was. I walked into the living room and took the small clay object off the mantel. I held it in both hands and closed my eyes, hoping for a profound insight or mystical moment. None came; just the special joy I always feel in the presence of birds. That evening, before we went out to meet friends, Ron and I peered through the kitchen window and said goodbye to our owl. “We hope we see you tomorrow,” we said. Early the next morning, I ran breathlessly to the kitchen. The tree was empty; the owl was gone. My sense of loss was quickly replaced by a feeling of gratitude. We had experienced the miracle of winged wisdom and I knew that owl would be with me for a long, long time. That Friday it was easy to notice the perfect moments. Other days, it’s more complicated. Part of my creative challenge to myself is to notice the magic in every day, even a day that’s prone to mundanity or challenges. How about you? How do you notice the gifts in each day? What are some of your perfect moments? Deborah, your reflections on the owl are just beautiful. My husband and I are fascinated by our cats. I can’t tell you how many times during the day we call to each other, “Can you come see?” so we can share their graceful poses, their serene faces, their playful antics. They are miracles, and life is so much richer for me because of them. Each morning when I walk, I try to see a new sight, hear a new sound, or notice a change in the path I always walk.